Hydraulic lift with machinery in a cabinet. The machinery occupies 0.5 m2 (width 950 mm, depth 550 mm), compared to the about 3 m2 required by a traditional machine room (for example width 1500 mm, depth 2000 mm). All the components such as the main switch and light switches, thermostat detecting the temperature control panel and pump unit are now placed inside a cabinet, 2 m high (minimum height to allow maintenance operations). Power unit and controller are very compact, making installation, maintenance operations and emergency rescue easier. The cabinet dimensions remain the same, independently of the machine features (capacity, speed, number of floors served): it can be installed close to the shaft up to 15-20 metres from the lift (depending on the hydraulic piping run). The maintenance operations of the lift panel and tank do not require access inside the shaft, as lifts with machine unit in the pit would require. 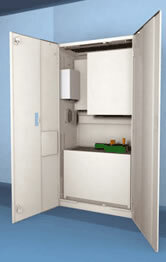 On opening the cabinet, with a specific key, the space necessary for maintenance and rescue operations is indicated. Machinery installation is similar to that for a traditional lift. Certified models cover the most flexible range of products on the market in terms of capacity, machinery size and finishes, landing and car door size and type.